Please complete the following stages. This web page includes your personal details, qualifications and previous agency work experience. Please do not worry all the information gathered is handled on a secure server and will not be shared with any third party personnel.... OUR CINCH PROMISE! You must complete all the required fields before we can accept your application. If you experience any difficulties completing the application form please see our FAQs and help guide to the right of this page. Every time we process a payment for you, we can send a text message to your mobile. This text confirms the amount that we have sent to your bank/building society and payment date. A valid email address is required to process the Cinch Group Registration form. (If permanent National Insurance number is not held, please forward documentation). Please detail any professional qualifications you hold. This page includes your Bank / Building Society details we also gather your eligibility to work in the UK. Please do not worry all the information gathered is sensitivity handled on a secure server with a SSL webpage and will not be shared with any third party personnel. YOU must complete all the required fields before we can accept your application. If you experience any difficulties completing the Application form please see our FAQs and help guide to the right of this page? All employees must read and complete the section below for their registration to be processed. NB: Copies must be countersigned by one of the following persons: Engineer (with professional qualifications), Surveyor, Trade Union Officer, Chairman/Director/Manager of a Limited Company. Accountant, Barrister, Solicitor, Teacher, Dentist, Police Officer, Nurse (SRN and SEN), Civil Servant, Officer of Armed Services (active or retired) or someone of similar standing. If you are unsure about who can countersign your registration please call our Registrations Department on 0114 478 9351 who will be happy to help. If you are from a country which is outside the European Economic Area and Switzerland we will need to see proof of your right to reside/work in the United Kingdom. Please select how you would like your holiday paid to you. 1. Cinch Group will reserve holiday pay which will accumulate on a weekly basis; this will be reflected on your payslip and will show in the holiday reserve section. When you take annual leave, payment will be made to you out of the accrued amount . 2. Holiday pay can be paid to you on a week by week basis. You remain entitled to take you statutory leave entitlement but will not be paid for weeks when you do not work. Please note, if this is not completed our default stance will be to pay you holiday pay with each payment of wages. Please provide the name, address and telephone number of your next of kin that may be contacted in case of emergency. If you have a P45 please send it to us when you have completed your application. Alternatively you can scan the document and upload in the box below. If you do not have a P45 please complete the following section. Please read all the following statements carefully and tick the one that applies to you. A – This is my first job since last 6 April and I have not been receiving taxable Jobseeker’s Allowance or taxable Incapacity Benefit or a state or occupational pension. B – This is now my only job, but since last 6 April I have had another job, or have received taxable Jobseeker’s Allowance or Incapacity Benefit. I do not receive a state or occupational pension. C – I have another job or receive a state or occupational pension. D - If you left a course of Higher Education before last 6 April and received your first Student Loan instalment on or after 1 September 1998 and you have not fully repaid your student loan, tick box D. (If you are required to repay your Student Loan through your bank or building society account do not tick box. I confirm that the information given above is correct. Client Contract The contract between us and the Cinch Group Client, which you have requested us to enter. Agency regulations Status Opt In. This Assignment may only be terminated by you on the same terms (if at all) as we ourselves can lawfully terminate the Client Contract. You may not terminate this Assignment without also terminating your contract of employment, without our written agreement. This Assignment will terminate automatically if the Client Contract is terminated (either by us or by the Cinch Group Client), or expires and is not renewed. If we terminate your contract of employment, we may simultaneously terminate this Assignment. You confirm that you have not previously worked in this role for the End Client (if this statement is incorrect, please provide full details below including assignment dates and duration). 1. What is the End Hirer Company’s basic activity? 3. What service are you providing? 4. Do you need to have relevant training, qualifications or experience to perform the service? 5. What training/qualifications/experience do you hold? 6. Do you consider that you are an expert in your field? 8. Beyond initial instruction, are you given further specific instruction about how you need to do the work? 10. If the answer to Q9 is yes, can you overrule any instruction on how to perform the services? 11. Are you told where to perform the work? 12. If the answer to Q11 is yes, is this because you are site based and so, your service must be provided at a particular location? 13. Are you free to choose when you do the work? 14. If you are not free to choose when you do the work is this because of the restriction of site opening times? 15. Does any other party supervise you when performing the services? 17. Can you be moved from job to job or told to do a different job as priorities change? 18. If the answer to Q17 is yes, can you decline the request to move or alter jobs? We have agreed to provide your services to the Cinch Group Client / the End Client. You accept that we may withhold payment from you in respect of any period until we ourselves have been paid by the Cinch Group Client, and you agree that you have considered any credit risks and found them to be acceptable. In case of conflict between the terms of your Employment Contract and of this Assignment Schedule, the terms of this Assignment Schedule shall prevail, provided that (a) termination of an Assignment shall not terminate your Employment Contract; but (b) termination of your Employment Contract will automatically terminate this Assignment. fully indemnify us against any liability we may incur or loss we may suffer as a result of any failure on your part to do so. This Assignment Schedule is conditional on us entering a corresponding contract with the Client which either is or becomes unconditional. I declare that the information provided is correct and understand that it is my responsibility to inform the Cinch Group of any changes to these details. I declare that it is my intention to go on to work at another workplace for the Cinch Group upon completion of this assignment, and that I will promptly notify the Cinch Group if such intentions change. Below is an Eligibility Assessment. You will be asked a series of questions to establish your eligibility to claim tax relief on your travel costs each time that you start a new assignment. You will be expected to re-confirm these details periodically and will be responsible for advising the company if these details change as a consequence of a change of assignment, re-location or if food is provided by the labour user (client). In order for our employees to be eligible to claim a range of expenses, we must confirm that the assignment details conform with HMRC guidelines. Should these criteria not be applicable to this assignment then your assignment workplace will be classed as a permanent workplace and no travel and subsistence expense claims will be allowable. If you attend a workplace for a limited period of time or for a temporary purpose, subject to meeting certain criteria, your workplace can be defined as a temporary workplace. You do not expect to be at your current workplace for a period longer than 24 months. Due to the nature of employment with the Cinch Group Services, you are likely to work at a series of temporary workplaces and are unlikely to spend in excess of 24 months in one location. As a result, it is likely that you will be able to claim travelling and associated subsistence expenses incurred between home and each temporary location. The legislation concerning the definition of a temporary workplace is very complex and so, we will discuss this with you when you start each assignment to check that you can qualify for Income Tax and National Insurance relief on your expenses. In this regard, we will require you to complete the Eligibility Assessment on the next page to confirm your intentions in order for us to establish whether your assignment is a temporary workplace. If you are working at a permanent workplace you cannot claim tax free travel and subsistence expenses. As soon as a temporary assignment is reclassified as a permanent assignment you will be treated as working at a permanent workplace and so, you will no longer be entitled to claim expenses. 3. Are you happy to attend workplaces in more than one post-code location? 4. Are you a student working during your holiday? 5. Will you incur travel costs in attending the temporary workplace? 6. Will you incur costs associated with drinks and meals (subsistence) taken whilst on the journey to the temporary workplace or whilst attending the temporary workplace? In terms of the Employment Rights Act 1996 (the "Act") this Agreement gives details of your Terms and Conditions of Employment (“Contract”) with the Company together with other workplace information, as at the date of this Agreement. “Assignment” / “Assignments” means the position or project, pursuant to which you will be providing services to the Client, as detailed in the Assignment Schedule (if any). “Client” / “Clients” means the third party, to whom you will be providing your services pursuant to this agreement on the terms of the Assignment Schedule. “Assignment Schedule” means the schedule that will be provided to you in respect of each Assignment, before the commencement of any work. 2.1 You are employed with effect from [[CONTRACT START DATE]] to work on such projects and for such periods as we may from time to time require. 2.2 For the avoidance of doubt, we reserve the right to require you to cease or not to commence working on a project if we are unable to agree terms of business with the Client. The terms of this Contract apply at all times (subject to termination in accordance with Clause 9) whether you are currently engaged on a project or between Assignments. 2.3 You will perform all duties required of you by the Company at any location where we may require you to work from time to time. Where applicable, you are required to inform us as soon as it becomes apparent to you that you have worked or are likely to work at a particular location in excess of 24 months and, in any event, you must inform us when you have been working at a particular location for 20 months or more. 2.4 You will perform all duties required of you by the Company, which may be detailed in the Assignment Schedule which will be provided to you in advance of commencing an Assignment. The Company reserves the right to require you to perform such other additional duties as the Company may reasonably determine from time to time. The duties required of you may vary between Assignments. 2.5 You will remain employed by the Company during any period when you are not on Assignment. Termination of an Assignment will not automatically terminate this Contract. 2.6 You will devote the whole of your working time, attention and abilities to the duties required of you and will not at any time (including any period when you are not on Assignment) without the prior written consent of the Company accept any work for or be directly or indirectly engaged in or concerned with any other business. 2.7 Whilst employed by the Company you must comply with all the Company's rules, regulations and policies from time to time in force and any rules which the Company’s Clients and / or customers may require you to observe whilst working on their premises including any Health and Safety, Drugs and Alcohol Policies. 2.8 If you are aware or become aware of any reason relating to your health which may prevent you from carrying out any of the duties required of you by the Company you must notify the Company immediately. You warrant you are qualified to perform the duties as required under this Agreement. 3.1 Your employment with the Company began on the date of your first Assignment. For the avoidance of doubt, no employment with a previous employer counts as part of your period of continuous employment with the Company. 3.2 The Company will provide you with details of the role you will be required to undertake, the tasks to be performed, the location at which the work will be undertaken and the hours of work. This information will be supplied as part of the Assignment Schedule which shall take precedence in the event of a dispute arising between the Assignment Schedule and the Contract. 3.3 Details of terms and conditions relevant to each Assignment in respect of working time, night work, rest periods or rest breaks will be as set out in each Assignment Schedule. 3.4 You are obliged to work when required by the Company. Failure to adhere to this clause will have a bearing on receiving pay between assignments as detailed in Clause 8 and may result in termination of your employment and your Contract in accordance with Clause 9. 4.1 The Company undertakes at all times during your employment (and subject to the terms of this Contract ) to use reasonable endeavours to allocate to you suitable work and as a minimum guarantees that you will be offered and remunerated for at least 336 hours of work within a 12 month period (commencing on the start date of your continuous employment) paid at a rate at least equivalent to the then current National Minimum Wage (your "Basic Salary"), subject to the deduction of tax and National Insurance. 4.2 Subject to Clause 4.1, if the Company fails to offer you a minimum of 336 hours of work on Assignment (or a series of Assignments) during the 12 month period, the Company will pay you National Minimum Wage less primary class 1 National Insurance and PAYE in respect of each complete hour within that 336 hours that you have not been offered work. 4.3 The Company does not guarantee there will always be a suitable Assignment to which you can be allocated. You acknowledge therefore that there may be periods when no work is available for you. The provisions of the Apportionment Act 1870 shall not apply to this Contract. In such circumstances subject to Clause 4.1 and 4.2 the Company has no obligation to pay you when you are not carrying out work, except in the operation of Clause 8.4. 4.4 You are obliged to work when required by the Company. If you do not work when required to do so, the Company is entitled to terminate your employment in accordance with Clause 9.3. 4.5 Your rates of pay will at all times be no less than the National Minimum Wage currently in force from time to time (in the UK) per hour worked. Enhanced rates may be applicable depending on the work you are required to perform. Where enhanced rates or overtime rates are applicable you will be notified of this prior to the commencement of the work. Payment will be made weekly in arrears directly into your nominated bank account on Friday of each week in respect of the hours worked during the preceding week, subject to deduction of Tax, National Insurance Contributions and appropriate deductions for holiday pay as set out at Clause 10.5. 4.6 In addition you may be entitled to additional profit related pay in relation to work undertaken on each Assignment. If this is applicable, you will be notified of this prior to the commencement of the work. The total gross pay (less any allowable expenses) is subject to PAYE and National Insurance Contributions. 4.7 You authorise the Company at any time during the continuance of this Contract and in any event on termination howsoever arising, to deduct from your remuneration (which for the purposes can include but is not limited to salary, pay in lieu of notice, holiday pay, overpayments, loans and sick pay) all debts owed by you to the Company (and interest were appropriate), the cost of repairing any damage or loss to the Company’s or Client’s property caused by you and any loss suffered by the Company as a result of any neglect or breach of duty by you. 4.8 If the final payment is insufficient to allow for the whole amount of any deduction, you will be required to repay any outstanding amount due to the Company within 14 days of the termination of your employment. 5.1 If eligible, you could be able to claim allowable travel expenses on the basis set out in the Company’s Expenses Policy. You must submit an expenses claim form and any supporting evidence as required by the Company to the Company (the form will be provided to you). The Company shall make all necessary statutory deductions for Tax and National Insurance. 6.1 You have confirmed you will be available to work up to a maximum 40 hours per week on Assignment and not less than one hour per week. However, assigned hours of work will vary according to the requirements of the Company’s clients and will be notified to you in the relevant Assignment Schedule. 6.2 You agree to work in excess of an average of 48 hours per week should the Company require you to do so. If you wish to opt out of the 48-hour average limit, you are required to give the Company 3 month’s written notice of your intention to do so. 6.3 For the avoidance of doubt, there may be periods when there is no work available to you. In this regard, you will be employed by the Company during any period when you are not on Assignment. Accordingly, you agree that you will make yourself available to work for the Company at all times during periods when there is no work available to you. 6.4 In order to satisfy Clause 6.2, you must fully respond to the Company’s request for information concerning your availability for work and be able to actively demonstrate that you have sought a new Assignment for a minimum of one hour each day, Monday to Friday. 6.5 You must complete a daily record of your job search, evidence from your search for example (online CV applications, Newspaper articles etc.). The daily record form is available from the Company. 6.7 For the avoidance of doubt, failure to confirm your availability for work when you are not working on an Assignment will mean that the Company is entitled to consider this to be serious misconduct which may lead to a termination of your employment. 7.1 You do not have a normal place of work. You will be required to work at any of the Company’s premises or at the premises of its customers, clients, suppliers or associates, within the United Kingdom unless otherwise agreed, as the Company may determine from time to time as set out in the Assignment Schedule. The employers address is Unit 2, Shepcote Office Village, Shepcote Lane, Sheffield, S9 1TG. 7.2 You will not be required to work overseas for periods exceeding one month. 8.1 You must provide one week’s notice to the Company in order to terminate your employment. (b) one week's notice for each year of continuous employment with the Company up to a maximum of 12 weeks’ notice. (m) Failure to submit timesheets in respect of work done by you. 8.4 The Company will be entitled to terminate your employment without notice in the event that you do not work (without good cause, which will be determined at the discretion of the Company) when the Company requires you to do so. 8.5 The Company reserves the right at any time in its absolute discretion to make a payment of Basic Salary in lieu of all or any part of your entitlement to notice, less such deductions for Tax and National Insurance Contributions. 9.1 The maximum entitlement to annual leave is 28 days (including bank holidays) in a full working year (260 working days). If you work less than 260 days in a full working year your entitlement to annual leave will be pro-rated accordingly. 9.2 The Company's holiday year runs from 5th April to 4th April. 9.3 If your employment begins or ends part way through the holiday year your holiday entitlement for that year will be assessed on a pro rata basis. 9.4 Holidays must be taken at times agreed by the Company or the Company's client where appropriate and sufficient notice of request to take holiday must be given to the Company or Client. All holidays must be taken in the holiday year in which they accrue and cannot be carried over to the next holiday year without prior consent of the Company. 9.5 You will earn holiday pay at a rate of 12.07% of your basic salary which will be paid to you on a weekly basis and shown as a separate and distinct amount on your pay slip. In the event that we receive a specific request, we will retain your holiday pay in a holiday pay fund. You will be paid for each day of holiday authorised by the Company and the Client at an hourly rate calculated on the basis of your average income over the twelve weeks preceding the holiday. 9.6 If on the termination of your employment, you have taken holidays in excess of the statutory holiday entitlement which has accrued to you at that time you will be required to repay to the Company holiday in respect of these holidays. This will be taken out of your final payment. 9.7 The Company reserves the right to require you to take any unused holiday during your notice period, or during periods when the Company is unable to provide you with an Assignment. 9.8 Clause 6.6 as it relates to notifying the Company that you are available for work will not apply to when you are on holiday provided that you have complied with Clause 9.4. 10.1 If you are absent from work for any reason and your absence has not previously been authorised by the Company you must call the Company and the Client you are working for (before you are due to start work) on your first day of absence before 10am. Failure to do so could affect any sickness payment entitlement. People calling on your behalf, text messages or emails are not acceptable forms of notification. 10.2 In respect of absence due to sickness, injury or accident that continues for more than seven consecutive days (including weekends) you must provide the Company with a medical certificate stating the reason for the absence. Thereafter medical certificates must be provided to the Company to cover the remainder of the period of continuing absence. Failure to follow these requirements may result in disciplinary action and/ or loss of Statutory Sick Pay. 10.3 If you are absent from work due to sickness, injury or accident and comply with the requirements in this Clause you will be paid Statutory Sick Pay (“SSP”) in accordance with the provisions of the applicable legislation in force from time to time. For the purposes of SSP, the "qualifying days" are Monday to Friday inclusive. 10.4 If you become unavailable for work, you must notify the Company immediately stating the reasons for your unavailability. Failure to do so could affect any sickness payment entitlement. (b) customers and potential customers, their requirements and their terms of business with the Company; and (c)suppliers and potential suppliers and their terms of business (all whether or not recorded in writing or in electronic or other format). (c)	cause any unauthorised disclosure, through any failure to exercise due care and attention, of any trade secrets or Confidential Information relating to the Company or any of its Clients. 11.3 You must at all times use your best endeavours to prevent publication or disclosure of any trade secrets or Confidential Information. 11.4 These restrictions apply both while you are employed by the Company, and after your employment with the Company terminates. The restrictions will cease to apply to any information which becomes generally available to the public, otherwise than through a failure by you to observe these restrictions. 12.1 The Company will comply with the employer pension duties in respect of the employee in accordance with Part 1 of the Pensions Act 2008. 13.1 From time to time, the Company’s Clients may fall within the definition of an Employment Agency or Employment Business as defined in the Conduct of Employment Agencies and Employment Businesses Regulations 2003 (the “Regulations”). These Regulations contain a provision for you to opt-out. The Company will endeavour to provide you with an opt-out form in advance of you commencing work on an Assignment. If you choose to opt-out, you have the right to opt-in at the start of a new Assignment. 14.1 By signing this Contract and in conjunction with the consent request detailed below, you acknowledge and agree the Company is permitted to hold personal information about you as part of its personnel and other business records and may use such information in the course of the Company's business. In accordance with the data request below the Company may disclose such information to third parties (detailed in the data request) in the event such disclosure is in the Company's view required for the proper conduct of the Company's business or that of any associated company. This clause applies to information held, used or disclosed in any medium. (b) be handed over by you to the Company on demand and in any event on the termination of your employment. 16.1 The Disciplinary and Dismissal Procedure which applies to you are set out in the Company’s Disciplinary and Grievance (“D&G”) Procedure, details of which are available on request. The D&G Procedure is not contractual and the Company may change the terms at any time at its absolute discretion. The Company reserves the right to discipline you in relation to any Client complaint regardless of whether the Assignment to which the complaint relates is continuing at the date of such complaint or disciplinary action. 16.2 If you are dissatisfied with any disciplinary or dismissal decision taken in relation to you, you can appeal this decision. Please refer to the Disciplinary and Dismissal Procedure, details of which are available on request. 16.3 If you have a grievance about your employment, you are entitled to raise a complaint in line with the Company's Grievance Policy. The Grievance Policy is available upon request. There are no collective agreements applicable to you or which affect your terms of employment. 18.1 The contractual terms shall be in substitution for all or any existing contracts of employment entered into between you and the Company which cease to have effect on the date upon which you commence work under this Contract. 18.2 It is agreed that this Contract and any Assignment Schedule set out the entire Contract and understanding of the parties. This Agreement shall be governed and construed in accordance with the law of England and Wales. Each party hereby submits to the exclusive jurisdiction of the English Courts as regards any claim, dispute or matter arising out of or in connection with this Agreement and its implementation and effect. I acknowledge that I have received a duplicate copy of this Contract, I have read and understood the same and I agree to be bound by all the terms contained in it. I have been given the opportunity to receive an explanatory document relating to the clauses contained within this Contract. I have also been given access to the “Employee Handbook” which does not form part of this Contract. I understand that the Cinch Group will deduct associated employment costs (Employers NIC/Margin/Holiday Pay) from the contract income received and you have received an enhanced rate to account for this. If eligible to claim I understand that expenses are not paid in addition to the contract rate received by the Cinch Group, but I will receive Tax/NI relief for any processed claims. Cinch, is keen to ensure the best service is provided to its members. As part of this we are providing you with access to Cinch Perks at a discounted rate of £2.95. This will be shown on your payslip or remittance as a post-tax deduction as Cinch Perks. This offer is exclusive to you. We will continue to invest in making Cinch Payroll and customer service better for you. To continue that investment we have launched Cinch Perks providing you with even more benefits each and every week. I, Name, acknowledge that I have read, understood and accept this offer and the terms and conditions contained in the above Schedule(s), and agree to be bound by the terms and conditions of employment as outlined therein. Cinch Contracting Services Ltd intends to process payment in line with our contractual agreement with you. 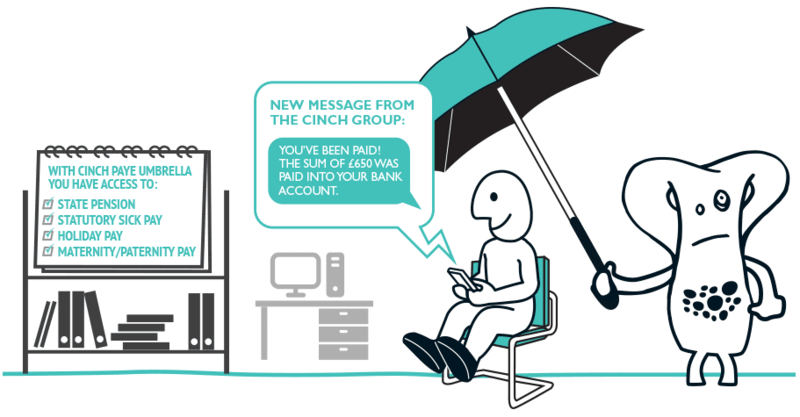 As part of this process the Cinch Group may also require your details to allow you to be adequately insured in line with your requirements for any services provided and to enable registration into Cinch Perks (where requested). Therefore, we wish to collect your personal data to help achieve the purpose. The terms listed below detail the information you are entitled to be provided with so that you may give your consent. I have read and understood the purpose for which my personal data has been requested. I freely give my consent to the collection, processing and storage of the personal data specified within this document, namely: All personnel, contractual and contact information to enable the registration and processing of payments and the arrangements of adequate insurance in line with your requirements. The data may be received by our registrations teams, payroll officers, insurers and transferred to our benefit package provider where requested. The data will be held for 6 years and I will be advised if this is subject to change. If the purpose for which my details have been collected should change, Cinch will inform me of the changes along with any other details within this agreement that may be affected. I will be informed of these changes in advance wherever reasonably possible so that I may have an opportunity to object. I understand that I have a right to withdraw consent at any time by writing to a director of Cinch in which case the details will be removed promptly from your systems and you will subsequently inform any recipients of the data. This may not be possible if a legal or statutory authority has requirements of the information which lawfully supersede my consent. I acknowledge that should I chose to withdraw consent, the withdrawal shall not affect the lawfulness of data processing that happened prior to the withdrawal. I am aware that there may be circumstances in which I have the right to access and request rectification or erasure of the data provided. I am aware that I may also have the right to restrict, object or request data portability. In the event of a serious concern which I do not feel I may address directly with the Company, I am aware that I shall be entitled to lodge a complaint with the relevant supervisory authority. I am aware that the legal basis for processing this data is consent. I consent to the Cinch Group collecting and storing data in respect of these terms.